New Delhi : The chairman and Group CEO of Bharti Enterprises, Sunil Bharti Mittal has received a total pay package of Rs 27.17 crore for fiscal year 2014-15, an amount which is 324 times of the median employee remuneration of the company. Sunil Bharti Mittal is the CEO of Bharti Enterprises and the Group flagship Bharti Airtel, with operations in 20 countries across Asia and Africa and a customer base of over 275 million, is India's largest telecom company and world's third largest mobile operator. Mittal's total remuneration dipped marginally by 2.52 per cent, from Rs 27.88 crore in 2013-14, largely because of a sharp decline in his "performance linked incentives" from Rs 13.5 crore to Rs 8.25 crore. His 'salary and allowances' have otherwise almost doubled to Rs 18.46 crore in 2014-15. Disclosing these details, the company in its annual report for 2014-15 said that Mittal's remuneration was 323.63 times of the median remuneration for all its employees. This ratio is the highest in case of Mittal in comparison to any other director for the company, followed by CEO (India and South East Asia) Gopal Vittal whose remuneration was Rs 5.34 crore (excluding perquisite value of stock options)-63.63 times of the median staff pay. The revenue growth during 2014-15 was 11.17 per cent and net profit growth was 100 per cent. The average increase in the remuneration of employees excluding key managerial personnel was 10 per cent. All listed companies have been asked to mandatorily disclose these ratios and comparisons, beginning fiscal 2014-15, under the new corporate governance norms of Sebi. 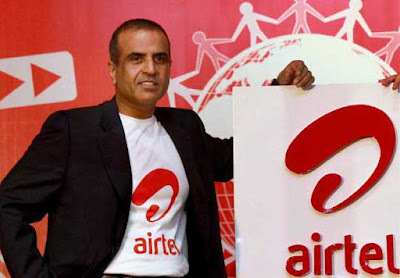 Bharti Enterprises was founded by Sunil Bharti Mittal with his two siblings in 1976. The company started with manufacturing bicycles before diversifying into other sectors. It entered into telecommunications industry in 1995. Bharti is present in many sectors with the largest revenue contribution coming from telecom industry.